Mio heart rate monitors come with patented MioSensors. The heart rate monitors allow for two-finger operation and do not have chest straps like other traditional monitors. The monitor's watch displays the percentage of your maximum heart rate and also the calories burned. We looked at a few of their models. This monitor comes in both pink and black and offers optional wrist straps in four color combinations. A stylish fitness accessory, it has a weight management system and a bonus interchangeable watchband. Its features include on demand ECG with accurate heart rate minus the chest strap. A visual indicator of exertion levels, percent of maximum heart rate used, five timers, calorie management system where you can even track your caloric intake throughout any given day, calories burned, and works with the Mio 3500 Calorie Countdown mode. It is a true measure of cardiovascular fitness and shows you when your heart is at rest. 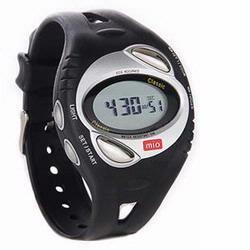 The sports watch includes date, time, alarm and calendar, and a backlit display and is water resistant up to 30 meters. You can also use this monitor as a beginning runner as it has walk/run features. It can be personalized using your body measurements and data. 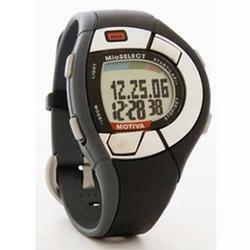 A bonus with this heart rate monitor includes the interchangeable band in orange and grey and has the MioSensor Guide for Healthy Living that will give you all the information you need on health, nutrition, diet, fitness, and exercise—all with carb and calorie tables for easy reference at the grocery store. 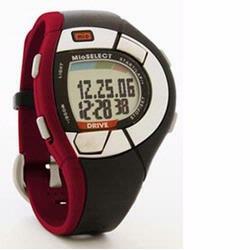 This Mio monitor comes in a red/black combo and offers four different optional wrist straps in four color combos. This monitor is created for fitness enthusiasts who wish to make the most of their workouts. It has on demand ECG and accurate heart rate monitoring. It is easy to use, easy to wear and has no chest strap. It can calculate calories burned during exercise and is designed to work in conjunction with the Mio 3500 Calorie Countdown program. It has 5 exercise timers including walk/run and boasts a full-featured sports watch that includes date, time, alarm, calendar—all with a backlit display. The watch is water resistant and comes with one interchangeable watchband to fit all your moods and you can buy additional bands. The bonus is the MioBalance Guide for Healthy Living. This monitor comes in blue and has optional wristbands in four color combinations. Again, this can take an ECG accurate heart rate with no chest strap. Its features include a visual indicator of exertion, full-featured sports watch that includes an alarm, exercise timer, date, and a backlit display. It is water resistant up to 30 meters and has a user accessible battery hatch. The operating modes include date and time, settable alarm and count up and down timers. This monitor comes in classic black with a free fat caliper and exercise planner. It also comes in pink and for those smaller wrists — petite blue. The Mio Classic and Petite models include the MioSense Guide to Healthy Living. Both the classic and petite model include on the Mio on-demand ECG accurate heart rate without a chest strap, LCD in an easy to read format, backlight with three second display, and a calorie management system. The sports watch comes with an alarm, chime, date, and is water resistant. The petite models are great for people with wrist circumferences of 6-3/4 inches or smaller. 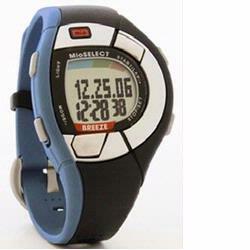 It has a stop watch/chronograph and MioSensor heart rate system that measures maximum heart rate and resting heart rate. It can also track your caloric intake, set calorie targets, and track the net balance of your caloric intake. Mio heart rate monitors come in many colors and have optional wrist combos that come in four colors. With any model, you can expect the Mio excellence without the bothersome chest strap to get that on-demand heart rate when you want it. 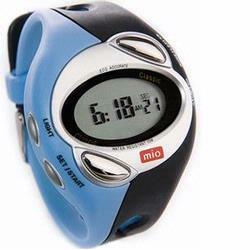 Mio also offers many sports watch wrist monitors in various colors.